Pavegen will make its pioneer US installation on Connecticut Ave. There was once a time when Pavegen founder, Laurence Kemball-Cook, had to break into a site to forcibly install his innovative technology. Today, Pavegen tiles, the unique flooring technology capable of converting kinetic energy from people’s footsteps into electricity, are a more than welcome addition to Washington DC’s urban landscape. And this time, the British cleantech company will be working with the District Department of Transportation (DDOT), the Golden Triangle BID, and ZGF architects to make its pioneer installation in the US. “We’ve created a product that can reshape the way people move in our cities, and with current digitization, our ability to connect physical and digital worlds through a single footstep places us at the forefront of the footfall energy-harvesting market,” says founder and CEO of Pavegen, Kemball-Cook. The Pavegen tiles are located across three sites at the Connecticut Avenue Overlook pocket park and are comprised of 68 generators. V3 arrays are used to provide a more interactive experience to the largest site, while simultaneously providing more visibility to the area. The remaining two sites are used to power LED under granite seating installed by the Golden Triangle BID. This provides round-the-clock lighting that lends itself to accessibility and pedestrian safety. 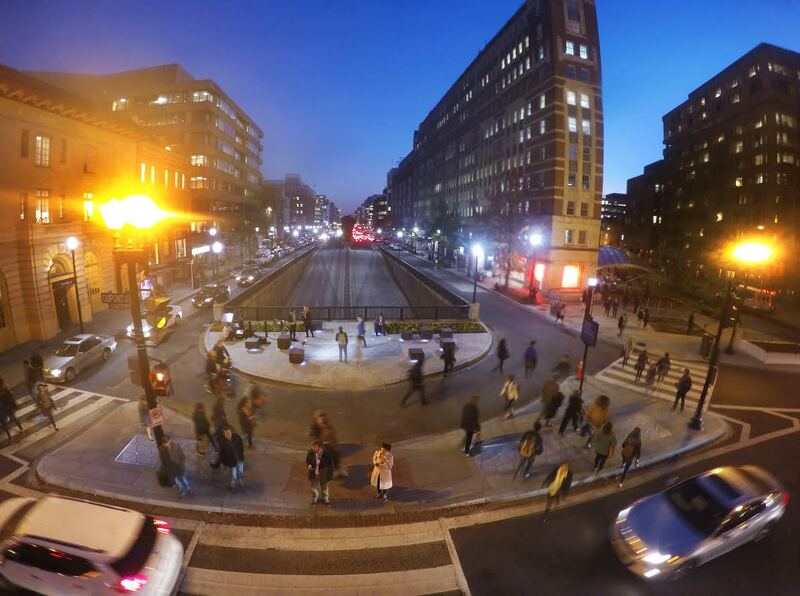 According to DDOT, Pavegen’s newest installation stands as a testament to their commitment to innovation and the nation’s continued push toward smart technology. Not only will DC pedestrians be producing their own clean electricity as they walk across the pavement, they can also generate data by relaying their footsteps via the wireless API embedded in the tiles to the Golden Triangle website as digital currency. The accumulation of this digital currency is a unique feature inherent to Pavegen’s overall vision. By making the energy they produce sustainable as well interactive, it can become a more vital part of the growth of smart cities. Eventually, this currency can be redeemed via discounts or other tangible items using an app. Pavegen’s efforts are specifically aimed to ensure that communities start to recognize the potential and importance of renewable energy. Beyond its impact for the environment, innovations such as this can help create a safer and more secure city, thus creating a positive impact in major districts. All things considered, it may be just what the world needs to spur the smart cities revolution.